I’ve been away for a while with work, so I’m late catching up with my correspondence. Sheila, Rick and Mrs B – thank you for your comments and apologies for being so slow in replying. I always enjoy hearing about other people’s experiences, so please keep them coming. Somewhat accidentally, I now have an international perspective to the blog. Steve has been kind enough to send pictures from the New York/New Jersey border. 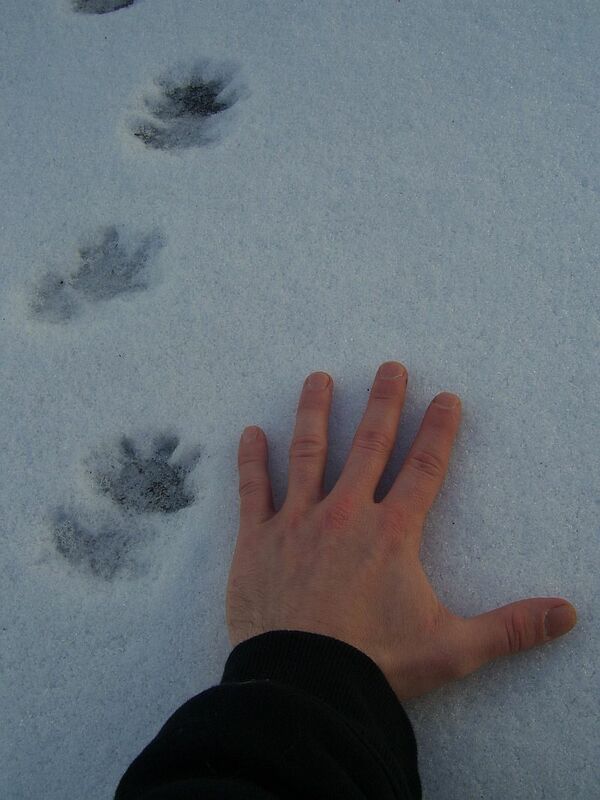 He found the tracks after sighting a fox near his house. 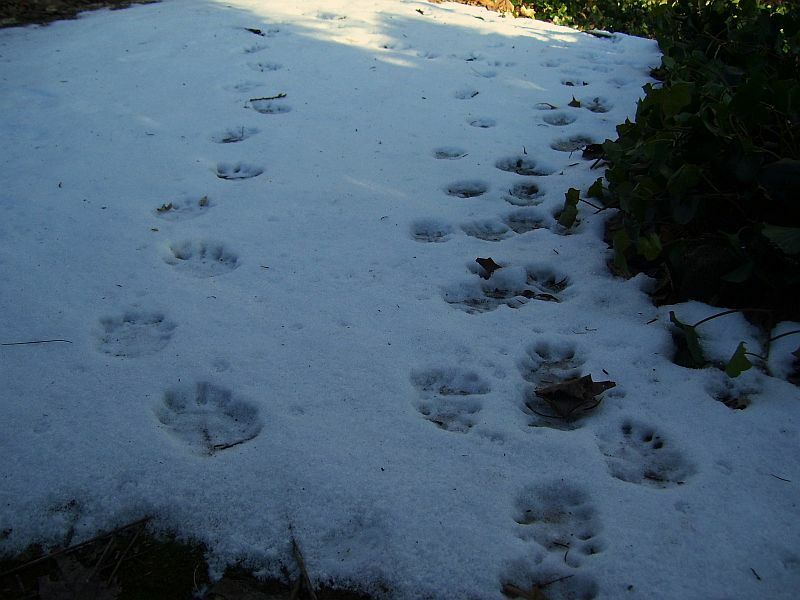 The problem is, they don’t look like fox tracks to me, at least not the familiar British fox tracks. 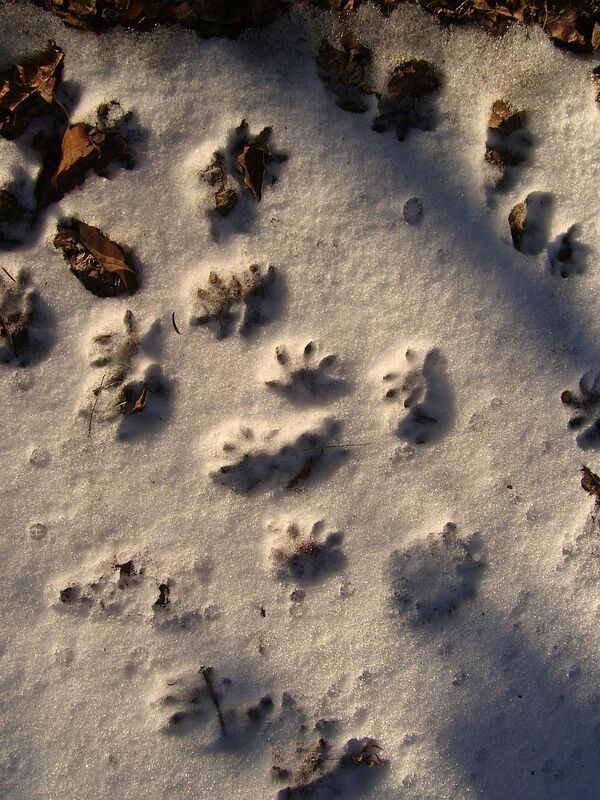 Fox tracks are small and neat and diamond-shaped. These are hand-shaped. I’m not an expert on North American wildlife, but the closest match I can find in the guidebooks is Raccoon tracks. Does this make sense? Do you get Raccoons in northern New Jersey? Do they walk around people’s houses? This is just my best guess. If anyone has any other ideas, please do let me know. as far as I can tell from the photos its a Raccoon as you said. Difficult to be sure.They are about 3×3 ins in size.The only thing similar is the Muskrat,a third of the size ,or an Opossum [third smaller]which has the back facing digit behind the rear paw. They do have Raccoons in rural and suburban New Jersey and most of the States have substantial populations of them. Hope this helps. I must confess that the New Jersey wildlife is a bit exotic for me so I’m quite willing to believe you that they’re possum tracks rather than raccoon. Mind you, Ghillie’s comment on the size and the rearward-facing digit of the possum may still point towards Raccoon. The truth is, I have no experience of either animal. Apart from the credible reports of a Raccoon in Devon, they’re both pretty far away from Bedfordshire. This is yet another case when I depend on the advice of experts. I got the same thing but a little different and it or whatever it is it got 2 of our chickens and I was searching and the closest mach I got was badger footprints.